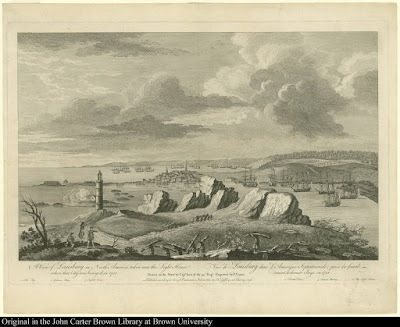 A View of Louisburg in North America, taken near the Light House when that City was besieged in 1758, Captain Charles Ince, engraved by P. Canot, published by Thomas Jeffreys, 1762, John Carter Brown Library of Early American Images. 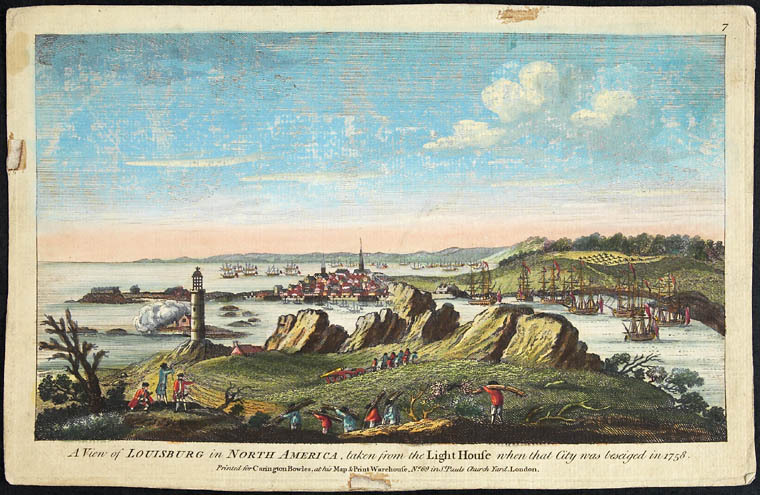 A View of Louisburg in North America, taken near the Light House when that City was besieged in 1758, Captain Charles Ince, 1762, Libraries and Archives Canada via Wikimedia Commons. A View of Louisburg in North America, taken near the Light House when that City was besieged in 1758, Captain Charles Ince, published by Carrington Bowles, date unknown, Libraries and Archives Canada. 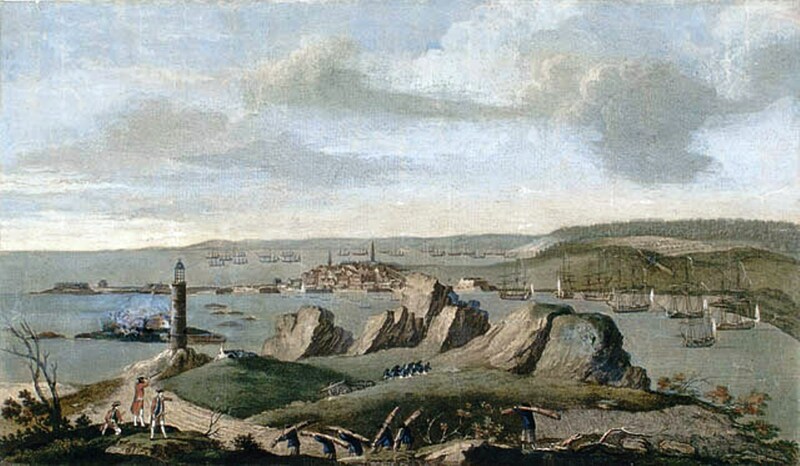 The siege and eventual capture of Louisbourg was a major blow to the French in Canada, and a necessary step to the eventual British victory in the French and Indian War. To take Louisbourg, the British commander General Wolfe ordered his soldiers to attack and seize Lighthouse Point on Breton Island. There they erected batteries to bombard the French fleet and fortifications. Captain Charles Ince of the 35th Regiment of Foot observed and illustrated the scene above, presumably on July 20, 1758, when, as Lieutenant William Gordon of the 40th Foot wrote: '400 seamen were sent on Shore to assist on the right.' They were employed in reinforcing the batteries, which had recently come under a withering French fire, and possibly in working the guns themselves. The next day, these batteries inflicted the fatal blow on French possession of Louisbourg when they set fire to the Célèbre and Entreprenant. These two warships, along with several others, can be seen floating to the right in the above illustrations, awaiting the doom that these sailors haul to their batteries. The sailors are uniformly dressed in round hats, jackets that end above the top of the thigh, and petticoat trousers. In the Wikimedia print, they wear blue jackets, while in the Libraries and Archives of Canada version they wear blue and red.